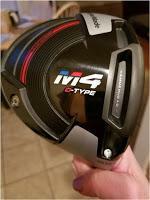 Is the TaylorMade M4 Twist Face Driver Right for You? 1. Curvature of face for shots that work back toward center of club face. 2. Large sweet spot for off-center hits. 3. Ability to counteract golfers’ common misses, especially from high toe and low heel impacts. 4. Geocoustic™ engineering–geometry and acoustical engineering for forgiveness and great sound. When Dustin Johnson won the Sentry Tournament of Champions in Kapalua, Hawaii this January, the TaylorMade M4 Twist Face driver was unveiled and golfers were immediately intrigued. After all, DJ hit 73% of fairways that week and almost made a hole-in-one on the on the 12th hole, a 433-yard par-4! Just because D.J., a long-hitting PGA Tour pro, used Twist Face with success, does that mean this new golf club can also help lengthen and straighten your drives? Golf for Beginners tested the new technology and our results are in! Barry, a mid-handicapper, recently tested both the M3 and M4 drivers during a club fitting at Grande Dunes Golf Performance Center. Barry decided it was time to replace his well worn TaylorMade R5 driver with a new club, hoping for improved distance and straighter drives. Eleven years is a long time to go without replacing clubs in your bag as cutting-edge technology really can improve an amateur's game. For Barry, the M4 was the right choice during both quantitative golf club and swing analysis. Twist Face also felt light and comfortable in his hands as he took his swings; Barry said he gained yardage but the most important thing was accuracy and less "military-style" golf. "In my opinion, the new TaylorMade M3 and M4 Twist Face golf clubs are the first new technology that really works for the amateur golfer. Twist Face technology does what it was designed to do. It cannot change/fix a poor swing but it definitely tempers the poor result by keeping the ball in play more often. This leads to lower scores which is something we all want. If you do connect with pure contact, the ball travels farther, picking up yardage you probably did not have with your current driver. Most of all, this driver helps you keep the ball in play which can definitely lower your score." Barry continued, "The M3 has all kinds of adjustable weights which I don't think I would benefit from so I chose the M4D only after hitting many balls under the guidance of a trained club fitter. I now have the correct shaft and club head. In my opinion, the TaylorMade M4 Twist Face driver is the first new technology in many years that makes sense for the average golfer." The "D" in the TaylorMade M4 "D" stands for "draw" and is designed to promote a draw for someone who is prone to slicing the ball. According to the TaylorMade website, "M4 D-Type features a two-tone crown cosmetic that has been altered to make the face angle appear more open, resulting in a more closed face at impact. Additionally, 41 grams of weight have been moved heel-ward to deliver draw bias." There is also a massive sweet spot on the club, a term TaylorMade called the "Hammerhead slot", which is supposed to improve distance and forgiveness. When I play golf with Barry, I notice that he is still getting used to the new TaylorMade M4 D; when he hits the club on the sweet spot, the ball does fly farther and straighter than I have seen when he hit his TaylorMade R5 driver. Barry only plays one 18 hole round per week and, now that the warm weather is upon us, we are going out and playing nine holes during the week. I can see the improvement in his drives so I think the swing assessment and club fitting was right on track - TaylorMade M4 D Twist Face is the right club for him. There is no better way to purchase a new golf club (or set) than through a club-fitting process. Take the time to be fit for your measurements (Barry's club shaft was shortened by about a half inch) and swing a few different golf clubs before going through the entire process. Have you tried the TaylorMade M3 or M4 drivers? Tell us what you think in the comments section of this golf blog and on Twitter @Golf4Beginners.